Hill's™ Science Plan™ offers a wide range of products that are clinically proven to provide a precise balance of antioxidants and high quality ingredients to meet your pets' specific needs. 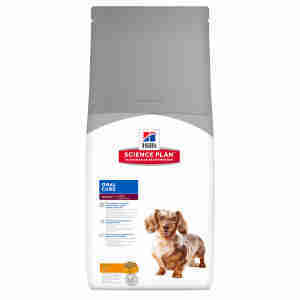 Hill's™ Science Plan™ provides a precise balance of 50 nutrients to keep your pet healthy at every stage of its life. Meeting specific needs through superior nutrition while avoiding excesses and deficiencies. All of our Science Plan™ products contain a proven, powerful and exclusive antioxidant formula to support a healthy immune system. A healthy immune system is essential to keep pets in peak condition throughout life. Because we only use the highest quality ingredients, we are able to deliver great tasting products your pet will love. To provide variety, we also offer many of our products in a choice of exciting flavours. At Hill's™ we're pet owners too, which is why we appreciate the commitment you make to your pet's health. That's why we won't compromise on our promise to supply you with the finest food, using only the highest quality ingredients. Hill's™ Science Plan™ Canine Adult Oral Care Chicken is clinically proven to reduce plaque and tartar. With antioxidants and advanced oral care technology. Clinically proven kibble technology to reduce plaque and tartar. * Based on the recommended manufacturer retail price, and recommended feeding guidelines from the manufacturer. ** Please note that you will be responsible for the cost of returning the product back to PET SUPERMARKET® and you will be eligible for a full refund of the price paid for the food. If you received free delivery with your order, and the refund brings your order total under the PET SUPERMARKET® free delivery threshold you will be charged at the prevailing rate as per our postage tariff on the day on which you placed your order. Chicken (minimum Chicken 30%, Chicken and Turkey combined 50%): Ground maize, chicken and turkey meal, ground rice, cellulose powder, animal fat, digest, pea bran meal, dried whole egg, vegetable oil, potassium chloride, flaxseed, L-lysine hydrochloride, salt, dicalcium phosphate, taurine, L-tryptophan, vitamins and trace elements. Naturally preserved with mixed tocopherols, citric acid and rosemary extract. Very good. Worth every penny. Our mini schnauzer is healthy and great teeth and coat. She loves these and the big size seems to make it more satisfying. I have a greyhound and a whippet. Sighthounds, with their long muzzles, are prone to dental problems. As both hounds seemed to regard our cats' Science Plan as a grazing station, I decided to try them on this Oral Care recipe kibble. They love it, tho they do seem to regard it as a treat! I finally settled on this food by chance. I was feeding it to one of my terriers to slow them down at dinner time as the biscuits are bigger than normal and they`re excellent for this. My other terrier has struggled for several years with being itchy- he`s a cross with a Bichon and suffers with food intolerences which are aggravated by his wirey, sheep-like coat. One day, I ran out of his food and fed him Oral Care. Within two days he`d stopped scratching. My two British Shorthairs love these oral biscuits from Hills. They regard them as treats rather than food helping to keep their teeth in good order. At their annual MOT with the vet their mouths were in excellent condition and their teeth had miniscule plaque deposits. For me, having the biscuits delivered in large bags saves a lot of effort. I save money with the lower prices and post free delivery. And Pet Supermarket always beats its delivery deadline by at least a week!! My vet recommended that Charlie (girl cat)be fed the Oral Care food from Hills. Buying it here means that I don`t have to lug a big bag back on the bus and with the added bonus it`s cheaper too. Charlie has also requested that I buy several other products from Pet Supermarket and is very pleased with her purchases and sends her love to all.